Thanks to an odd alignment of the stars, I found myself in Amsterdam with my youngest son over Thanksgiving. 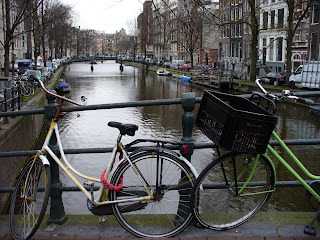 A road trip was needed -- and Amsterdam it was, thanks to a sweet package assembled through my favorite online travel site http://www.go-today.com/. In front of us, a large, well-dressed woman traveling with a faux fur coat closely resembling Ivan the circus bear. It obviously pained her to be stuck in Economy with us common folk, especially as she started to put her pet coat in the bin above her and encountered Matt's duffel bag stored sideways. It was abundantly clear that, on her planet, incorrectly stowed luggage is tantamount to finding a fresh turd in the overhead bin. She poked the bag and announced, "Well, that's a piggy package" to the half-dozen empty storage units near her screaming "Fill me, fill me." We, her fellow world travelers, just stared. In the seat behind us. . . a toddler. A sick toddler. A sick, screaming toddler. A sick, screaming, inconsolable toddler. A sick, screaming, inconsolable toddler who was close to coughing up a lung everytime he shrieked and sobbed. I have nothing against sick, screaming, inconsolable toddlers -- I've traveled with a couple of my own back in the day -- but with visions of H1N1 sugarplums dancing in my head and directly into my immune system, I told Matt, "We're moving as soon as we're wheels up." And move we did -- to the back of plane with space to burn. I repeat, it was heaven. About nine hours later, Northwest Airlines gently deposited us at Schipohl Airport and we began navigating our way toward Amsterdam. Getting to Amsterdam from Schipohl is easy -- with typical Dutch efficiency, there is a train leaving for Centraal Station about every nanosecond. Buying tickets, however, is another thing, especially with our New Best Friend -- Tony, a carpenter from Quebec. Tony's English was less than polished and he was completely, but cheerfully, flummoxed by the automatic ticket kiosks. He couldn't understand the directions, so he asked us for help. It was at this juncture we learned Tony faced an even greater ticket-buying challenge -- namely, the machines didn't take euros, just debit and credit cards. And, of course, Tony only had euros. Misery loves company -- my debit card didn't work on the Dutch machine, and my credit card pin number came across as gibberish. Thus, our fates became ultimately and irreparably intertwined: Tony, Matt and I needed to buy train tickets from a real person. This is easier said than done at the Schipohl train station because, obviously, they'd like you to use the ticket machines. As a result, the ticket counter is cleverly hidden from most public view. But after spinning around like a weather vane several times (and a stop at a cleverly hidden information booth), we found the ticket counter, made our purchases and, with train tickets in hand and Tony chattering non-stop, clambered onto the train to Centraal Station. Tony was so excited he carried Matt's duffel. We sadly parted ways with Tony in front of Centraal Station, heading off in search of the Hotel Citadel. According to its web site, the hotel is a 10-minute walk from the station and on one of Amsterdam's primary tram lines. Of course, we followed the wrong primary tram line but, with the help of a hotel bellman who had nothing better to do than direct two hapless Americans to a completely different hotel than his, we did a little u-turn and found our home for the next four days. Call me crazy, but I think European budget hotels rock, and the Citadel rock-star rocked: INCREDIBLE location, cozy breakfast room, great staff, great coffee, partial view of the 15th century spires of Nieuwe Kerk. Other amenities included a postage-stamp hotel room with thin walls, comfy beds and extremely eloquent plumbing. There were going to be no surprises as we -- and everybody else in the hotel -- took care of business in the bathroom. The bathroom. Let's just say it was equal parts ingenuity and insanity -- basically an open floor plan where toilet, sink and shower were one. Spacious enough, but somewhat drainage-challenged -- suffice to say, we had our own little wading pool after the first shower of the day. And the lights. All the lights (including the bathroom) in our room were activated with our hotel room key card. Really. No key, no light. "The key controls all," Matt intoned, as we problem-solved this unique little feature. But all in all, our room and the Hotel Citadel were quite satisfactory. And with a little freshening up, we were ready to take on Amsterdam.